A fine quality late 19thc /early 20thc French Kingwood & ormolu mounted circular occasional table with Scagliola top. The top consists of a superbly figured Scagliola, circular, top, supported by a brass circular moulding. The rails are of serpentine form supported by fine, tapered cabriole legs. 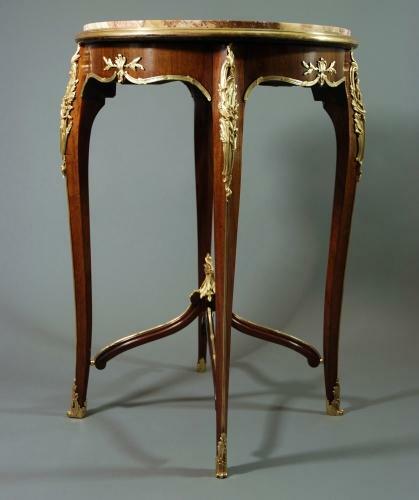 The rails & legs are fitted with fine quality ormolu mounts of various floral & foliage design. The legs lead down to finely cast ormolu feet with a cross stretcher with ball supports & a central ormolu decoration . This piece has been restored in our workshops & the mounts professionally cleaned. Underneath the base there is a storage label saying 'Hudson's Depositories', Kings Road, Chelsea & the name Viscount Bury. Further high definition photographs are availlable on request.